The most popular show of Hindi Television, that entertained a generation of an audience over a period of 7 years, Kasauti Zindagii Kay is back again with a whole new cast and a new storyline. The original show, one of the longest running in the history of Indian Television was created by Ekta Kapoor’s Balaji Telefilms and bears Shweta Tiwari as Prerna, Cezanne Khan as Anurag Basu, Urvashi Dholakia as Komolika, Poonam Narula as Nivedita Basu, and Ronit Roy as Rishabh Bajaj in the lead roles. The reboot of the show that is going to start today, casts Erica Fernandes and Parth Samthaan as the star-crossed lovers, Prerna Sharma and Anurag Basu, and Hina Khan as the glamorous antagonist Komolika. The show is created and developed by Ekta Kapoor. The recurring cast includes actors like Sahil Anand as Anupam Sengupta, Pooja Banerjee as Nivedita Basu, Uday Tikekar as Moloy Basu, Shubhaavi Choksey as Mohini Moloy Basu. The new cast is under colossal pressure because of the massive reputation that the roles come with. Erica, speaking about her role as Prerna expressed that she relates to the character at a deeper level in certain traits like being strong and independent, standing up for what’s right etc. In an interview, the 25-year-old actress said that though she was a kid when the original series was broadcast, she remembers sitting with her parents and watching the episodes with them. She also revealed that though she has watched some of the episodes before the shooting began to feel the gist of originality, the reboot would be novel and might differ vastly from the old in its storyline. Breaking out of his teenybopper image, Parth Samthaan is all set to portray the intense Anurag Basu in Ekta Kapoor’s reboot of Kasautii Zindagii Kay, for which his fans have been ecstatic and eagerly waiting for the show to start. When asked about the show, Parth told the media laughingly that he only remembers watching people getting married and remarried. He elucidated that as a kid even if he didn’t understand anything he recalls walking across the living room where his mother and sister are watching the shows. And while he didn’t watch any of the shows, he said he still remembers various names like Kyunki Saas Bhi Kabhi Bahu thi, Kahaani Ghar Ghar Kii, Kkusum, etc. The promos released by the channel so far have received immense love from all age group audience. One of the first promos had Shah Rukh Khan introducing the new lead characters alongside narrating the storyline. Watch it here. The new series is going to commence from 25th September at 08:00 PM IST on Star Plus. The broadcast will be from Monday – Friday. 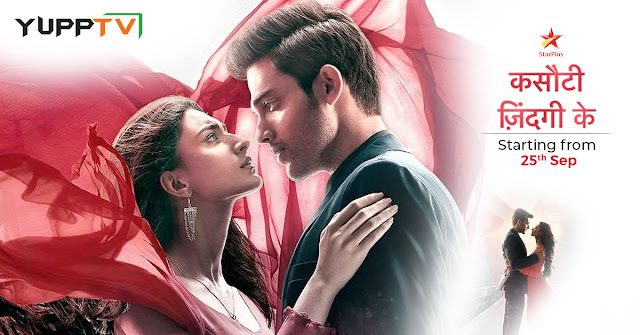 Overseas audience from the Middle East, Europe, and APAC Regions can watch new Kasauti Zindagii Kay on YuppTV. YuppTV App allows the users to watch the Indian television serials and shows on Smartphones, Smart Televisions, Laptops, computers, Tablets, and many other internet-enabled devices.